Runner’s Paradise is a combination of picture book and travel guide about the world's most fascinating trailrunning routes off the beaten track. The concept is unique: There is a variety of ways for YOU to get involved in this global adventure, e.g. go on running expeditions with the author, meet like-minded people from all over the world and become a real part of the book and this unique story. Book sales supports the German Kinderglück foundation. Trailrunning, meaning to run almost exclusively on small trails and paths, is becoming extreme popular among fitness enthusiasts and experienced long distance runners. New trailrunning events emerge every other week around the globe, usually following competition standards: with starting number and stopwatch. Travel agents catering to running events most often limit their customers to the participation of a city marathon, followed by a few days of sight seeing. Runner's Paradise is different: relaxed trailrunning adventure travels without stopwatch and competition formats. Instead, we want to enjoy foreign cultures and unique adventures through recreational trailrunning. Runner's Paradise presents a selection of 12-15 global trailrunning adventures. The places are handpicked. The photographs and trip reports are fascinating. They make you want more and will motivate you to the hair-ends. We will be providing practical information for individual trip planning: advice about transport and accommodation, important contact details, maps, elevation profiles, etc. Another chapter is devoted to issues like intelligent preparation and equipment. Additional materials, such as GPS data and short clips from various tours are available on our internet platform. 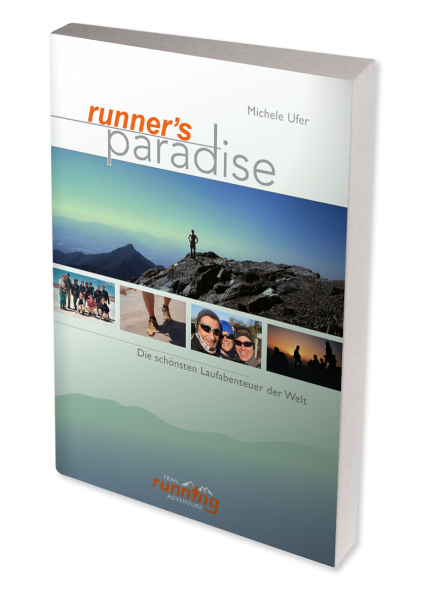 Runner's Paradise will be published as a German and an English edition; in the future also in French. It will be proposed at the world's largest tourism fair ITB for an award as the most innovative book. A percentage of the earnings of the book sales will go to the foundation “Kinderglück”, which gives disadvantaged children and young people the chance to witness a unique sports experience. 3 large publishing houses are already interested in Runner's Paradise. Whether you are a beginner or an experienced ultra runner, this is truly something for everyone who wants to dream of future runs and YOU can let these dreams come true. The book will attract speedhikers and ambitious nordic walkers as well, because it is all about discoveries and experiencing nature and culture. And some of you may want to purchase the book to give it away to good friends or family members. The production of Runner's Paradise(1st edition) is set to take app. 2 years. All tours are being planned and researched first, before the realization of each trip. The collected data is then organized to create a first script. Subsequently follow layout, editoral work and translating. And then the eBook and the hard-cover edition will be produced and printed. A major part of the project is the communication and inclusion of participants and partner during the production.